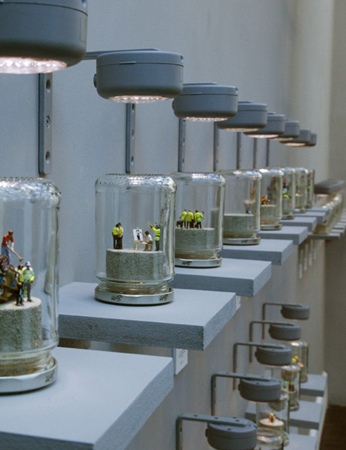 A nice mixture of genre-established artist Slinkachu, a snow globe and protest culture in small: James Cauty created short riot scene miniatures in jam jars and characterized them as »Greenpeace Armageddon Factoid Riot« or »French Extremist Students Contained«. In addition to the sculptures the artist made a film for every scene. Both is shown here. Btw. Cauty is best known as one half of the hitmaking duo The KLF and as co-founder of The Orb.